I have uninstalled and reinstalled QGIS several times from the OSGeo4W application. I have done this with no problem on several other times, but now I cannot get the tools to load. Most of the help simply say to just use the OSGeo4W application and not to worry about anything else. What do you do when the OSGeo4W application is not working. Do I need to change the Windows environment variables manually? I have never had to do this before. I now see you just have to switch option at the bottom of the toolbox from "simple" to "advanced". I have never had to do this before. Not the answer you're looking for? 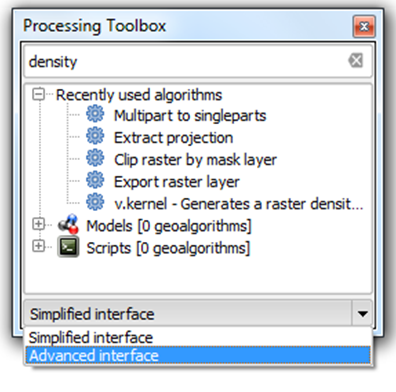 Browse other questions tagged qgis saga osgeo4w toolbox or ask your own question. Where did Processing Algorithms go? How to resolve error when launching OSeo4W Shell: Windows cannot find .bat file?